AP PolyCET Syllabus 2019: Candidates seeking admission in to all Diploma Courses in the field of Engineering / Non Engineering or Technology offered at various Polytechnics institutions in Andhra Pradesh State can apply for AP PolyCET 2019. Before preparing for the polytechnic entrance exam, students should know the syllabus thoroughly decided by the SBTET (State board of Technical Education and training), AP. If you are in search of AP Polytechnic Entrance Exam Syllabus, then you are at right place. Here we have provided subjects wise syllabus. Candidates can get free AP PolyCET Syllabus Pdf published by the SBTET, AP here. The AP PolyCET Exam Syllabus based on class 10 subjects like Physics, chemistry & mathematics. 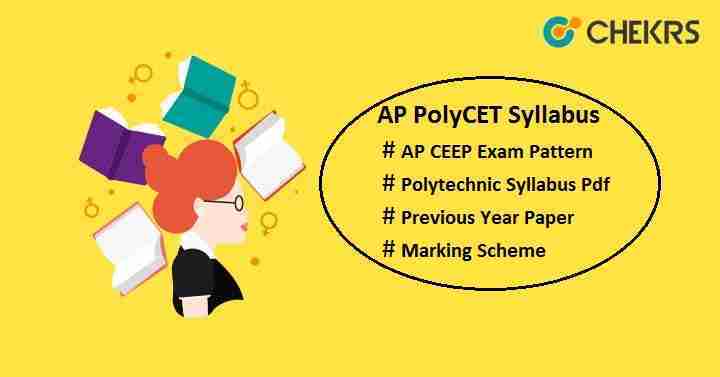 Those who have completed the exam syllabus, take a look on the AP PolyCET Exam Pattern to know about the exam and paper pattern. Students must check the previous year paper to get the exact idea about the AP PolyCET Question Paper. To get through AP Polytechnic Common Entrance Test (AP PolyCET), it is necessary to clear the entrance test. So to perform well in exam, one must practice AP PolyCET Previous Year Paper. To download the free AP Polycet (CEEP) Paper, Click Here. Solving last year paper helps us to improve our level of confidence, overcome the fear of exam, increase speed & accuracy, and improve time management skills. Hope the contents in this article are sufficient for all the candidates who were searching the AP Polytechnic Exam Syllabus along with the exam pattern and also the previous year paper of AP PolyCET.